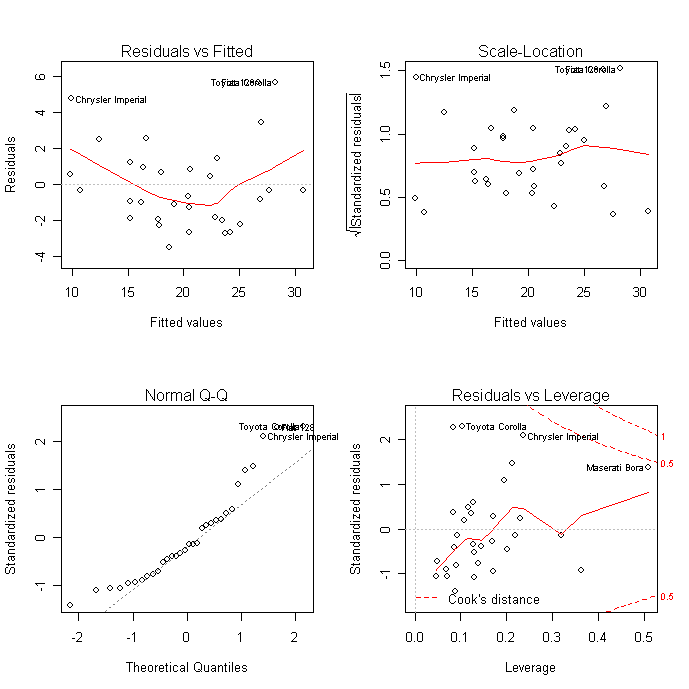 R provides comprehensive support for multiple linear regression. The topics below are provided in order of increasing complexity. For a more comprehensive evaluation of model fit see regression diagnostics or the exercises in this interactive course on regression. You can compare nested models with the anova( ) function. The following code provides a simultaneous test that x3 and x4 add to linear prediction above and beyond x1 and x2. You can do K-Fold cross-validation using the cv.lm( ) function in the DAAG package. Sum the MSE for each fold, divide by the number of observations, and take the square root to get the cross-validated standard error of estimate. 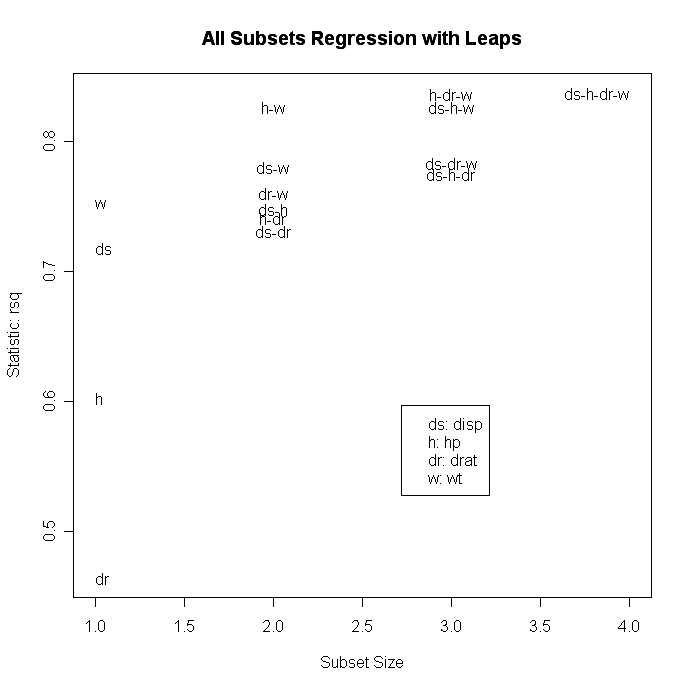 Selecting a subset of predictor variables from a larger set (e.g., stepwise selection) is a controversial topic. You can perform stepwise selection (forward, backward, both) using the stepAIC( ) function from the MASS package. stepAIC( ) performs stepwise model selection by exact AIC. 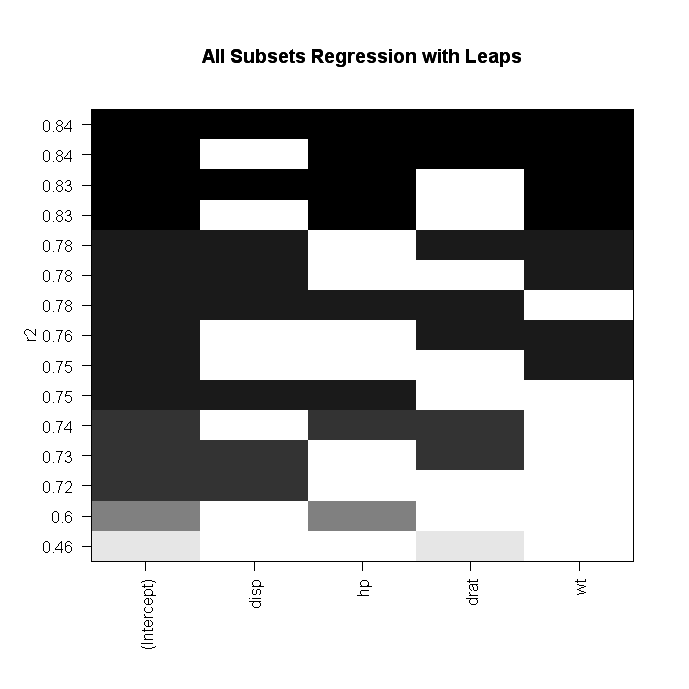 Alternatively, you can perform all-subsets regression using the leaps( ) function from the leaps package. In the following code nbest indicates the number of subsets of each size to report. Here, the ten best models will be reported for each subset size (1 predictor, 2 predictors, etc.). # plot a table of models showing variables in each model. # models are ordered by the selection statistic. subset( ) are bic, cp, adjr2, and rss. The relaimpo package provides measures of relative importance for each of the predictors in the model. See help(calc.relimp) for details on the four measures of relative importance provided. The car package offers a wide variety of plots for regression, including added variable plots, and enhanced diagnostic and Scatterplots. The nls package provides functions for nonlinear regression. See John Fox's Nonlinear Regression and Nonlinear Least Squares for an overview. Huet and colleagues' Statistical Tools for Nonlinear Regression: A Practical Guide with S-PLUS and R Examples is a valuable reference book. 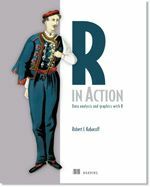 There are many functions in R to aid with robust regression. 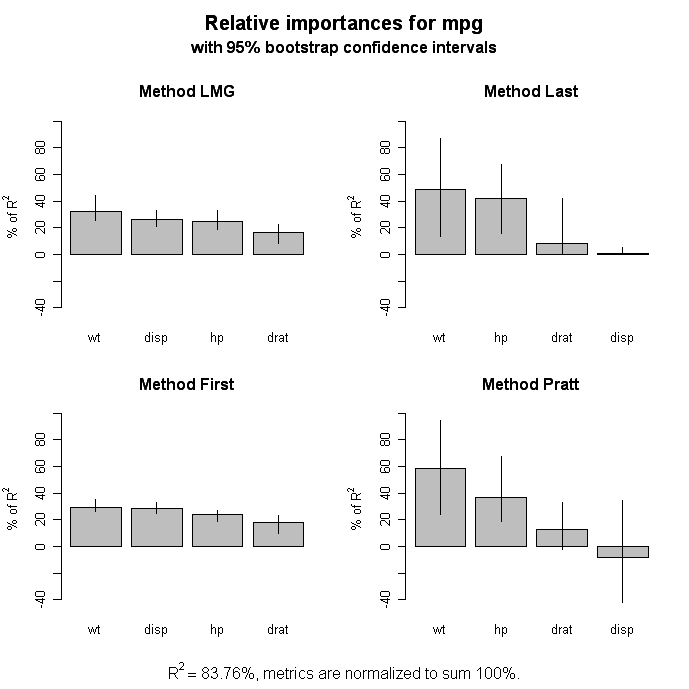 For example, you can perform robust regression with the rlm( ) function in the MASS package. John Fox's (who else?) Robust Regression provides a good starting overview. The UCLA Statistical Computing website has Robust Regression Examples. The robust package provides a comprehensive library of robust methods, including regression. The robustbase package also provides basic robust statistics including model selection methods. And David Olive has provided an detailed online review of Applied Robust Statistics with sample R code. This course in machine learning in R includes excercises in multiple regression and cross validation.